The threat of global climate change has increased interest in planting trees. Trees absorb carbon dioxide from the air, produce oxygen, and conserve energy with their shade. Following the current recommendations of the International Society of Arboriculture and the National Arborists Association for planting and maintenance of trees is important to help trees establish and thrive. The first consideration in selecting the right tree is to carefully evaluate the site for exposure, drainage and available space. Trees classified as small can be 20-30 feet tall at maturity. 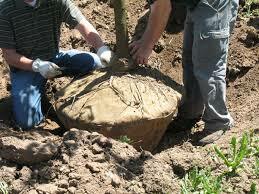 When the tree has been selected, dig a shallow hole three times wider in diameter than the root ball. Homeowners often select balled-in-burlap trees for their yards. Next, and this is very important, locate the trunk flare by loosening the burlap and string and carefully pulling away soil from the trunk. The trunk flare is where the spreading trunk base connects with the roots. To determine the depth of the planting hole measure from the trunk flare to the bottom of the root ball. The hole should be that deep and no deeper! When planting a tree, incorrect planting depth is the most common error. Place the tree in the hole with the trunk flare at one to two inches above the grade. Cut away the burlap and rope and at least the top eight to sixteen inches of the wire basket. Unless the soil is of poor quality, back-fill the hole using soil dug from the planting hole. Water the soil halfway through the back-filling, allow the water to drain and finish filling the hole. After backfilling, check for the trunk flare once more and thoroughly water the tree. Water the tree deeply every week, more often if the weather is hot and dry. Continue watering until the ground begins to freeze in the fall. 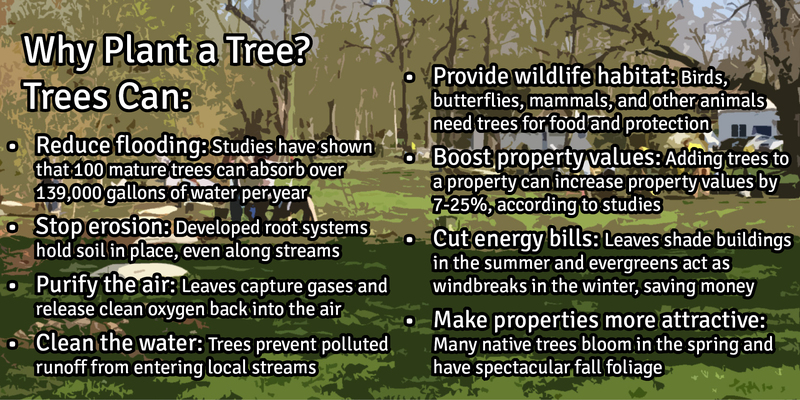 Trees will benefit from extra water for two or three years after planting. Trees can be planted in the spring or early fall. Fertilizers, staking and tree wrap are not usually necessary. If a tree has a small root ball and is not stable, stake the tree low on the trunk to allow some sway. Use three wooden stakes and smooth, wide, supporting material; not wire. Remove the stakes after one season. Mulching is helpful when done correctly. Spread organic mulch in a wide circle over the root zone at a depth of no more than two to four inches. The mulch should not touch the trunk nor should it be piled around the trunk in the volcano mulch style.